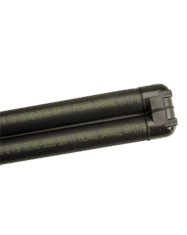 All GEO-Black piping products are marked with the name CB Supplies as the manufacturer, product trade name, nominal size, design temperature and pressure ratings, relevant ASTM standard numbers, (cNSF) CSA B137.1 and C448, NSF-geothermal, material designations, material cell classification, manufacturing date, production code and decremented footage numbering on coils 200′ and greater in length. Custom fabricated geothermal Uni-Coils are manufactured at our CB Supplies plant. Two coils of pipe, designed to your requirements for vertical depth or horizontal installations, are precision made with a fused on U-Bend. You can request CB Supplies Uni-Coils be pressurized and capped with snifter valves. When the pipe arrives at your shop, or installation site, a quick check with a pressure gauge will confirm the coils are free of any leaks.